Our Amish Olde Century Mission Dining Chair is Amish made with a beautifully ergonomic seat back, as well as a scooped and sculpted seat. View it in action here in this quick clip video. The three wide mission slats that comprise the chair back curve gently to support you as you sit at the dining room or kitchen table. Meals and celebrations are that much more enjoyable with the comfort this mission dining chair brings. Front legs flare just right to create a style that stands out from the rest. View this mission style in the matching Olde Century Mission Swivel Bar Stool and the Amish Olde Century Mission Stationary Bar Stool. Mission style furniture offers an elegant simplicity that dresses your dining room furniture for any occasion. The construction of mission furniture accents the solid hardwood with ease, letting the characteristics of the wood take center stage within its design. This American made chair will be handcrafted using your choice of hardwood. This Amish chair is manufactured using only traditional techniques for long-lasting quality. You have the option to add an elegant fabric or leather seat and this side chair is also available with arms. Questions? 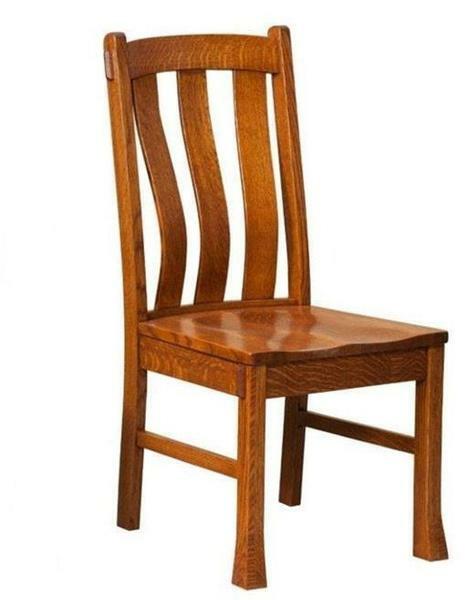 Call our Amish furniture specialists at DutchCrafters today to get answers on our solid wood, Amish made Olde Century Dining Room Chairs. We'll be happy to send you stain samples or to help you with your order - a 30% deposit is all that is required. Reach us toll free at 866-272-6773 or stop by our store in Sarasota, Florida. We use these incredible chairs everyday. Anyone who has an appreciation for comfortable, quarter-sawn oak chairs will be overwhelmed at their beauty.